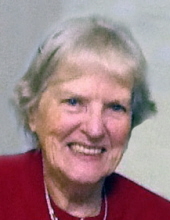 Darlene Marguerite Dunckel passed away March 26, 2019 at the age of 98. She was born January 17, 1921 in Diagonal, IA to Roy Hargin and MaryBelle Anderson and moved to the Salem area where Darlene grew up and attended school. She earned her nursing degree at St. Vincents in Portland and married Edward J. Dunckel while in nursing school. They moved to McMinnville where they raised their 4 children, Matthew, Mollie, Nancy and Deanna. After Ed’s retirement, they spent winters in Arizona playing tennis, golf, square dancing, round dancing and bridge. After Ed’s passing in 1998, Darlene moved to King City where she continued to play golf and bridge into her 90’s. She is survived by Matt and Mollie Dunckel, Larry Parnell, Nancy Dunckel, Deanna and Jeff Bergman, 9 grandchildren, 14 great grandchildren and 2 great great grandchildren. To send flowers or a remembrance gift to the family of Darlene Marguerite Dunckel, please visit our Tribute Store. "Email Address" would like to share the life celebration of Darlene Marguerite Dunckel. Click on the "link" to go to share a favorite memory or leave a condolence message for the family.